Fusion, when it works, is a wonderful thing. This Eastern Salmon Carpaccio from A Change of Appetite by Diana Henry blends Asian ingredients with the classic Italian dish/preparation of thinly-sliced raw meat or fish. The result is fresh, vibrant, healthy, and pretty much addicting. 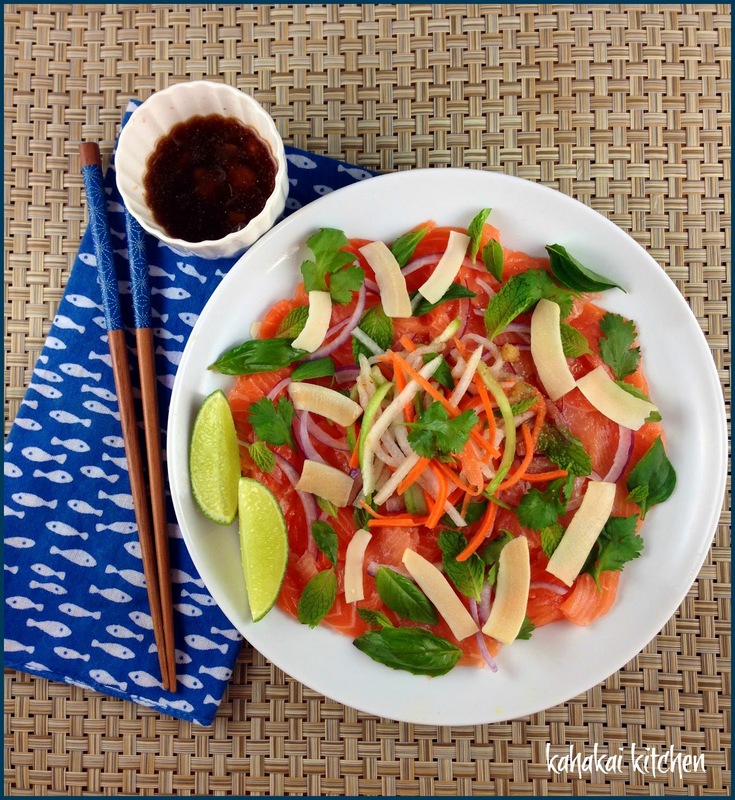 Using a sharp knife, slice the salmon finely, as if you were slicing smoked salmon. Put it onto a serving plate, or onto individual plates. Tear and sprinkle the herb leaves over the top. Spoon the carrot and daikon salad on top and sprinkle with red onion. Spoon the dipping sauce on top and serve with lime wedges. Heat the vinegar and sugar together gently in a saucepan, stirring a little to help the sugar dissolve. Let cool completely. Peel and trim the daikon and carrots, keeping them separate, and cut into matchstick-sized pieces (I just used my julienne peeler.) Put them into colanders. Mix 1 tsp salt into the daikon and 1/2 tsp into the carrot, mixing it well with your hands. Let stand for 10 minutes and squeeze out excess water from both. Put both vegetables into a clean bowl and mix in the sweet vinegar mixture. Keep in the refrigerator and serve nice and cold. It will keep about five days. Pound together chile and garlic and gradually add the lime juice, fish sauce, and sugar. Taste for seasoning and heat and adjust as needed. Add water if sauce is too strong. Notes/Results: I know some people cringe at the thought of raw fish but if you can get good fish and want to give it a try, carpaccio or ceviche are always a great way to go. You can put on extra dressing and lime juice and wait a few minutes before eating it and it will *cook* more. 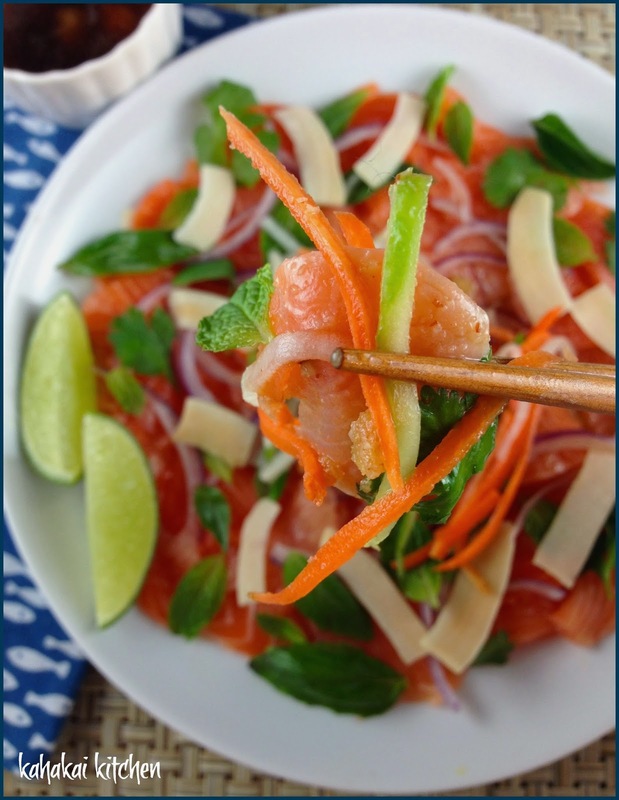 If you are a raw fish lover like me, you will likely love this dish. Such great fresh flavors--herby, tangy, sweet and a little bit hot. The texture of the picked vegetable with the smooth, velvety salmon is nice too. I have become slightly obsessed with topping different dishes with toasted coconut chips and I love the crunch and sweet coconut flavor they add. I just used 1 small fresh salmon fillet and made about 1/3 of the recipe. I also cut down the amounts of the daikon & carrot salad and dipping sauce recipes too (and reduced the sugar in the recipes). This carpaccio is very colorful and pretty on the plate! All the elements were delicious and I will make them combined or individually again. 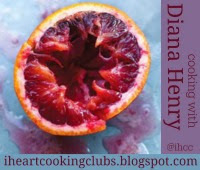 This post is linking up to I Heart Cooking Clubs where it is East Meets West week--with fusion dishes from Diana Henry. You can see what everyone made by checking out the picture links on the post. That looks so incredibly fresh and beautiful.....I would love a plate! That definitely looks spanking fresh ;-) I love all the gorgeous colors on this. I think all the toppings are what seals the deal for me on this dish. Namely the coconut chips (aren't those delicious?)! Good call adding those. That is a plate of vibrant freshness! It looks beautiful, fresh and delicious! And I like your little blue fish table napkin!